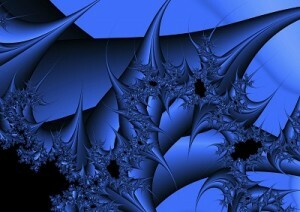 Fractals are new on the mathematics scene, however they are in your life everyday. Cell phones use fractal antennas, doctors study fractal-based blood flow diagrams to search for cancerous cells, biologists use fractal theory to determine how much carbon dioxide an entire rain forest can absorb. Fractals are in the mountains, clouds, coast lines, central nervous system, flower petals, sea shells, spider webs… they’re everywhere! And the really nifty thing about fractals is that they are not only cool, they’re super-useful in our world today. The second fractal is actually linked to Pascal’s Triangle. In the triangle, if you color all of the odd numbers black and the even ones white, then zoom out, that is what you would see. You say about the triangle paper that the grid is equilateral triangles. I believe if you measure the sides you will find that the base is longer than the other two sides, which are equal. This makes them isosceles triangles.